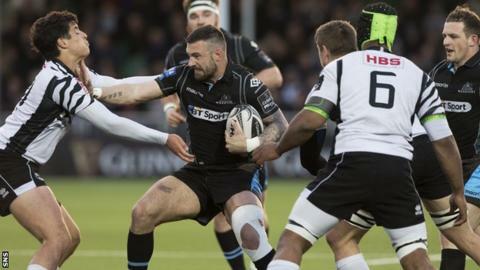 A much-changed Glasgow Warriors side cruised to a bonus-point victory over Zebre in the Pro12. Warriors rested a host of regulars but spent most of the first half in Zebre territory and secured the bonus point before the half-hour mark. The tries came from Nick Grigg, Peter Murchie, Rob Harley and Matt Fagerson, with Peter Horne converting all four. A Sam Johnson try and two from Matt Smith stretched Glasgow's lead with Kyle van Zyl and Kurt Baker replying. The visitors came into the match on the back of successive wins over Connacht and the Dragons, but they lost Carlo Engelbrecht and skipper Valerio Bernabo to injuries in the opening seven minutes, and they fell behind after 11. Glasgow captain Henry Pyrgos fed Peter Horne who slipped the ball to Grigg to dive over, with Horne adding the conversion. The hosts doubled their lead when excellent work by the pack sucked Zebre in on the left and a swift shift to the right allowed Murchie to cross, with Horne converting. Harley scored his first try of the season soon after, following a brilliant break from his own half by Johnson, with Grigg and Horne also involved in the set-up work. The bonus point was sealed before the half-hour mark, Pyrgos and Chris Fusaro linking brilliantly to play in Matt Fagerson for his maiden Glasgow try, with Horne making it four conversions from four. Johnson added the fifth try after the break, capitalising on great work from Fusaro, with Horne's hot streak from conversions continuing. In a nice moment for the Horne family, Peter then left the action and was replaced by brother George. Seconds later Glasgow scored again when a superb drive on the left allowed Smith to cross over. Zebre reduced the deficit slightly when Van Zyl cashed in on the first real lapse in the home defence to cross over. Smith added his second of the match thanks to a moment of luck when the ball was knocked out of Brian Alainu'uese's hands and it dropped into the arms of his team-mate to cross over. The hosts were sloppy in defence as Baker ran over late on but that did not detract from a solid display from Warriors, who are now six points adrift of the top four with two games to play. Rob Harley's try was his first of the season for Warriors. Glasgow head coach Gregor Townsend: "I'm happy. We got those four tries in the first half and probably made harder work of it in the second than we would have liked but at times there was some really good rugby played and the bench did very well when they came on. "Zebre played a lot of good rugby and they were committed, and that's a big improvement on Zebre teams that have come here in the past. They were tough to break down, but this new team we had out tonight found a way to do that. "The younger players really looked comfortable at that level - Matt Fagerson, Matt Smith, Cammy Fenton, Scott Cummings - and then you look at guys like Chris Fusaro and Sam Johnson who also did very well. "It's great to see so many fans turning up, when you're playing a team at the bottom of the table that are not bringing any fans and we are not going for the play-offs this year. The loyal supporters are still there supporting us." Glasgow Warriors: Peter Murchie, Leonardo Sarto, Nick Grigg, Sam Johnson, Rory Hughes, Peter Horne, Henry Pyrgos (c); Alex Allan, Pat MacArthur, D'arcy Rae, Greg Peterson, Scott Cummings, Rob Harley, Chris Fusaro, Matt Fagerson. Replacements: Cammy Fenton (for MacArthur, 61), Jamie Bhatti (for Allan, 50), Sila Puafisi (for Rae, 50), Brian Alainu'uese (for Peterson, 50), Lewis Wynne (for Fagerson, 71), Matt Smith (for Fusaro, 61), George Horne (for P Horne, 62), Sean Lamont (for Murchie, 61). Zebre: Guglielmo Palazzani, Kayle Van Zyl, Giulio Bisegni, Tommaso Castello, Mattia Bellini, Serafin Bordoli, Carlo Engelbrecht; Federico Ruzza, Johan Meyer, Maxime Mbanda, Valerio Bernabò (c), Gideon Koegelenberg, Guillermo Roan, Oliviero Fabiani, Bruno Postiglioni. Replacements: Sidney Tobias (for Mbanda (62), Andrea De Marchi (for Postiglioni, 62), Jacopo Sarto (for Ruzza, 62), Kurt Baker (for Bisegni, 68). Not used: Pietro Ceccarelli, Derick Minnie, Marcello Violi, Matteo Pratichetti. Not Used: Ceccarelli, Minnie, Violi, Pratichetti.